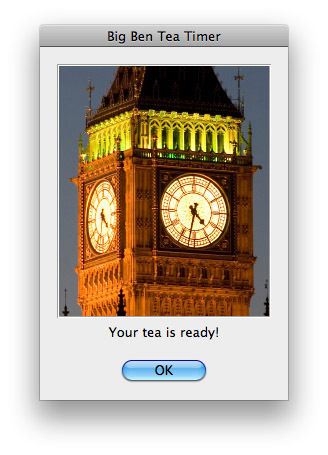 Big Ben Tea Timer is a countdown program which alerts you when your tea is ready. The Countdown can be displayed in the dock. Can I buy a license outside of the Mac App Store? No. The full version is only available from the Mac App Store. Keep in mind that Big Ben Tea Timer is intentionally simple and I intend to leave it that way. There a lots of timers with myriads of features out there that wil surely implement feature X. But they lack the simplicity and style because they are usually overloaded with too much features. So my answer will probably be "no". But that does not mean there aren't any nice things to add. I'm looking forward to a few nice additions. I decided that I don't like the program and want a refund. If you are unsure if you want to pay for the full version, use the 14 Day Free Trial. Big Ben Tea Timer is localized for English, German, and French. If you want to translate to your language, drop me a note. You need to translate 50 short text strings and you will of course get the full version for free. 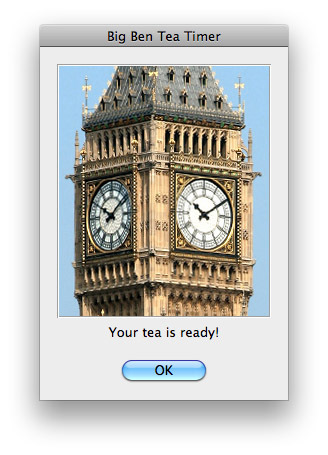 Big Ben Tea Timer needs Mac OS X 10.6.6 or newer.